C Battery, 29th F.A. Bn, spent the better part of the winter of 1942/43 in Tent City, Oklahoma. This self propelled field artillery unit was shipped from its home base of Camp Gordon, Georgia, to Fort Sill, Oklahoma. Our assignment was to train Artillery Cadets. Life in Tent City during the winter months was extremely difficult. Home based comforts would be sorely missed during this stay. Heat, a must, was provided by a little pot-bellied stove of sheet steel centered in the tent. The amount of heat given off during a cold night did not compensate for the effort needed to keep the stove in production. More sleeping hours were spent huddled in blankets hugging the space near the stove than in the cots provided. Outside moving orders were welcomed no matter the temperature. The Firing Range and its activities became a luxury. Photo Courtesy the University of Kansas! On the Firing Range, C Battery was assigned the use and care of World War One French 75mm Howitzers. Our battery was equipped with M7's. An M7 is a Self Propelled 105mm Howitzer. Briefly, it is a boxlike affair sitting atop of a Sherman Tank Chassis. The driver's side provides space for the driver and the gun sight. The 105mm Howitzer rests in the center. At the right a 50 Caliber machine gun is mounted on a well greased Turret. Room for the cannoneer is tight in the Turret area. Seven to ten men is the usual compliment during its operation. 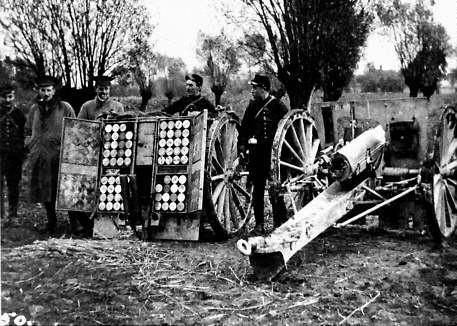 French 75mm Howitzers became toys in our hands. The small shell could be handled easily. It was light in weight and shell plus powder casing were one. We removed the lanyard from the firing pin and fired the weapon by pressing the firing pin proper, not unlike firing a pistol. We would adopt this method of firing in Combat. We were able to load, fire and eject the shell casing and not allow for the weapon to return from recoil. We drove the students and instructors nuts during multiple round firing. We would cooperate with the instructor during single round bracketing of the target. The fun would come when firing for effect and multiple rounds. Three rounds ordered were fired in about three seconds flat resulting in one puff of smoke on the target. The question from the instructor was always the same. "Did the Gun misfire?" would sound on down. "No, Sir, we fired three rounds," would be our answer. One instructor was a true non-believer. He left his spotting post after ordering the gun crew away from the Howitzer. He came down to our firing position in order to physically count the shell casings of the last three rounds. He counted and, angry as Hell, he left us. From that point on a ten second cadence must be sounded on multiple rounds. Firing became work. Photo Courtesy of Irving Smolens! A Fire Mission was ordered, along with a parade. General Barton and his guests would sit in Review and the M7's would be used. Joan Blondell was heading up a U.S.O. show at the Camp and was one of the honored guests. The very beautiful Joan Blondell was one of the top actresses of our day. She presented the General with an unusual request which was granted. Joan wanted to fire a live round from an M7. There was a brief Parade in Review when the weapon selection was made. The number one gun of Staff Sergeant Joseph Gaiteri was the choice. For lack of room in the box, the Sergeant ordered a crew of three for the Joan Blondell firing. "Craven, Kazolowski and Russo" were the names called out by Sergeant Gaiteri. Craven would be at the gun sight. Russo would load and unload the 105 Howitzer and instruct Joan Blondell. Kazolowski would take the elevation side at the machine gun turret side. 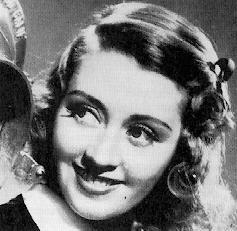 Joan Blondell would be placed to the right of the Gun cradle and out of harms way. The silence and tranquility of the bright sunny day was shattered by an extra loud noise which seemed headed for our M7. It was Joan Blondell, led and followed by an entourage of Officers, Stripes, and U.S.O. personnel. Her beauty stood out from the crowd. A slight breeze tossed her golden hair from side to side as it basked in the bright sunlight. Her light skin texture was made up and to perfection. Her selection of a form fitting white suit, skirt and jacket accentuated the great body stacked inside. She was lifted up to Craven and myself by all too willing hands from below. Craven and I did hesitate, and brought her inside after our senses returned to normal. We helped her to her firing position and instructions were in order. After she fininshed posing for the camera, I began my instruction. I could not overstress the fact that she should not move an inch when she is ordered to fire the weapon. I explained the reason for standing still. I explained the recoil of the gun barrel in its cradle and she nodded in understanding. I called out to Sergeant Gaiteri, "We are prepared for firing." A brief time passed and Gaiteri's arm went up with the cry of a Fire Mission of one round. I placed the shell in the chamber and shut the breech. I then turned to Joan who was exicited as one could be, and placed the lanyard in her tiny soft hand. "Remember, stay in place and pull the cord hard when I call out the order to fire," was my final word. Sergeant Gaiteri's arm went down and the order to fire was sounded. I whispered to Joan, "Now, pull the cord." Pull she did and the gun went off with a mighty roar. I had never, up to that firing heard such an explosion. In addition to the blast, the dark black and dense, putrid smelling smoke which bellowed from the breech when I extracted the shell casing, filled the box and caused all sight to be momentarily shut off. A moment or two would pass before sight was restored to us by some clearing of the smoke. My first thought was for Joan, so I focused on the cradle position. I looked, blinked and searched again. No Joan. She was not in the cradle position. I then turned toward the loud curses that I heard and the machinegun turret. She was cursing up a storm and embraced the turret ring as if her life depended on it. I walked over to her and gently tried to convince her to let go. Hell, it took the combined strength of Craven and myself to pry her loose. She was wriggling and screaming and Craven and I were now anxious to get her out of our sight. Officers and non-coms were now gathered below offering the same willing arms to take her down. What a mess she was! The black grease of the machine gun turret covered her blonde hair, her pale face and almost the entire front of her formerly white, form fitting suit jacket. She was thrashing about so hard that she literally slid from our grip and into the waiting arms below. In order to focus attention away from Joan, a Fire Mission was sounded with an instant fire command. I loaded the cannon and fired. This second round was much more defective than that fired by Joan. The cannon roar was much louder and the black smoke from the ejected casing let out a heavy cloud which covered the entire M7. A strange hissing sound penetrated my left ear and my head hurt badly. Kaz came over and he was in even greater pain. Craven was not affected. Kaz and I climbed down and informed Seargeant Gaiteri of the fact that we were hurt. The Sergeant called for transportation which arrived in a hurry. Kaz and I were removed from the firing range and transported to a Medical Facility. I underwent a very painful examination at this emergency session. Hours later, two "Ear, Eye, Nose and Throat specialists" conveyed their initial finding to me. I was informed that the trauma of the blast had resulted in two perforated eardrums along with Tinnitus in the left ear. "Follow up at the Base Camp will determine the true depth of the injury," was the parting remark. The training exercise came to a close and our unit returned to Camp Gordon in Georgia. The Camp facilities took over the care of the punctured eardrums and Tinnitus, now constant. The initial results offered at Fort Sill had proven to be correct. This injury would remain and influence my lifestyle to my dying day. I was discharged from treatment many months after the injury. I left with the feeling that nothing was done to correct the situation. Quiet may help the eardrums, yet little was known about the constant Tinnitus. Quiet was not provided. I went to war with the 4th Division and served from H Hour on D-Day until the War's end. D-Day plus two brought about a transfer from C Battery and into the reconstruction of B Battery which had been destroyed when its LCT hit a mine at sea during its approach to Utah Beach on D-Day. Hearing aids offer little help. Sound amplification is a boon to the hearing of words distorted still. Yet, this benefit is nullified because the Tinnitus level of over 100 decibels is also raised. The constant bilateral Tinnitus which coexists with the trauma induced Hearing Loss makes for an almost impossible communication on a good level. Throughout the passing years the question "What if?" surfaces. Yes, what if I had chosen the second of the two defective rounds for the Joan Blondell firing? I think hard upon the lifestyle change imposed by this defective artillery shell. After all, it was random selection made by me. Note: Peter N. Russo was born in Brooklyn, New York. A member of C Battery, 29th FA, at the time of this story, and later, when B Battery was reformed, he was transfered into the new B Battery, as their Chief of the #1 Gun Crew! The beautiful actress, Joan Blondell, continued a lengthy career in the entertainment industry, finally succumbing to leukemia. She passed away at the age of 73 years, on December 25, 1979.